Moscow Oblast (Roushie: Моско́вская о́бласть, Moskovskaya Oblast), or Podmoskovye (Подмоско́вье), is a federal subject o Roushie (an oblast). Its aurie, at 45,900 km2 (17,700 sq mi), is relatively sma compared tae ither federal subjects, but it is ane o the maist densely populatit regions in the kintra an, wi the 2010 population o 7,092,941, is the seicont maist muckle federal subject. Thare is nae offeecial admeenistrative centre o Moscow Oblast; its public authorities are locatit in Moscow an athort ither locations in the oblast. The oblast wis foondit in 1929. It borders Tver Oblast in the northwast, Yaroslavl Oblast in the north, Vladimir Oblast in the northeast an east, Ryazan Oblast in the sootheast, Tula Oblast in the sooth, Kaluga Oblast in the soothwast an Smolensk Oblast in the wast. In the centre staunds the federal ceety o Moscow, which is a separate federal subject in its awn richt. The oblast is heichly industrialized, wi its main industrial branches bein metallurgy, ile refinin, an mechanical ingineerin, fuid, energy, an chemical industries. ↑ "Moscow (oblast, Russia)". Encyclopædia Britannica. Retrieved 1 August 2010. 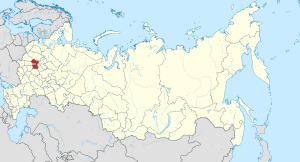 Wikimedia Commons haes media relatit tae Moscow Oblast. This page wis last eeditit on 23 Mey 2018, at 18:29.